*Subtotal of order before tax must be at least $250. Offer good only on ground shipping. Orders with free shipping cannot be split shipped. Orders are processed within one business day of being placed. Business days are M-F not including holidays. Orders will ship within one business day after processing, if all items are in stock. Orders with items not in stock will be shipped as soon as all items become available. 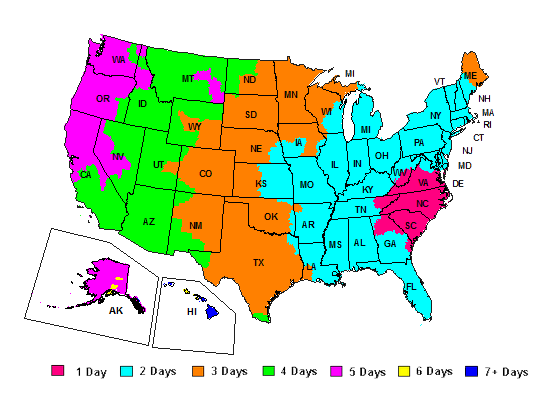 See map below for estimated shipping times for ground deliveries. Ground shipping is only available for the continental US. We cannot deliver to Post Office Boxes. Premium Shipping, including next day, early AM, and Saturday delivery is not available from the carrier in all locations.